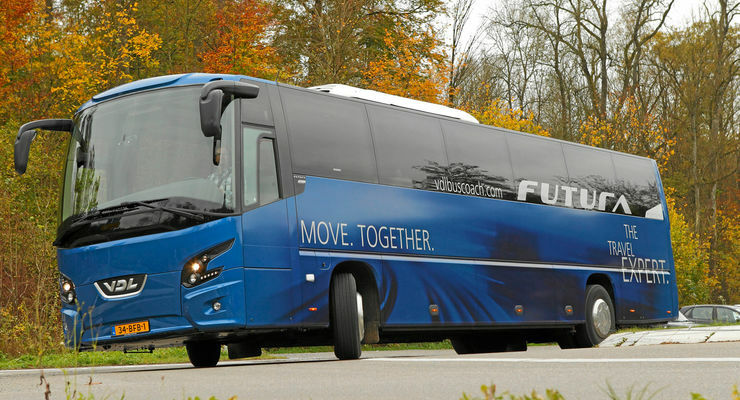 Middle-deckers are becoming popular—VDL fielded one of the first of these buses with its Futura FMD2-129. And it´s breaking records. Being in the middle has never been bad for mass appeal on the market. 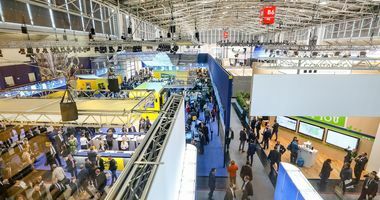 Both political campaigners and marketing strategists are familiar with this tactic, and they employ it to varying degrees of success with their target audiences. Middle-deckers, i.e., the lower versions of the familiar high-deckers, are now enjoying greater popularity. 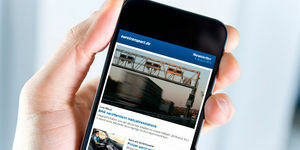 Setra recently introduced its high-quality MD Comfort-Class variants and, at the other end of the price spectrum, Van Hool intends to launch its competitively priced, Macedonian-made EX series on the market. However, one contender already anticipated this trend in advance and is now enjoying unbridled success: the FMD from VDLs new Futura series, which is derived from the modular coach system of the FHD. This approach has often proved to be the recipe for success. 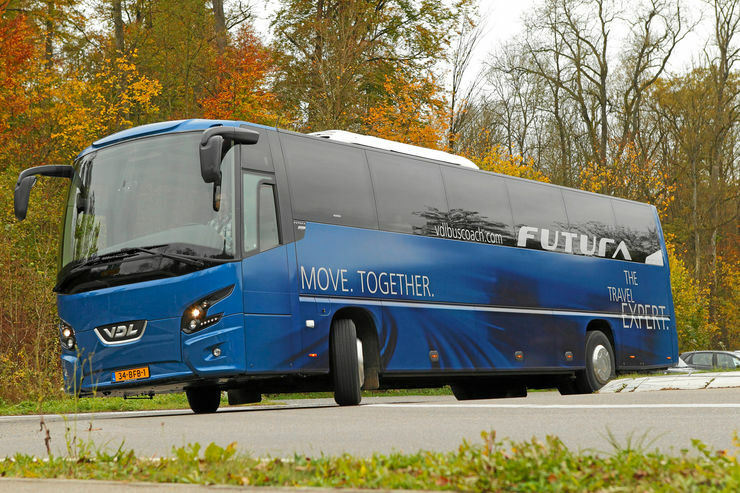 Since Euro 6 was introduced in early 2014, the Dutch, who focus mainly on efficiency and lightweight design, have already sold more than 160 buses from this series—including 43 units of the FMD2 launched later on. 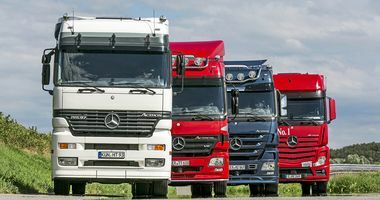 According to VDL´s marketing manager Wim Chatrou, one trend is becoming increasingly clear: the trend away from high-deckers and towards 13-meter two-axle vehicles. This plays straight into the hands of VDL, which has traditionally been skilled at keeping weight under control. 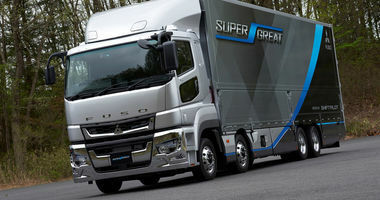 An unladen weight of 13.6 tons is quite acceptable for this long two-axle vehicle, and spending around 5,000 euro more than for the short version is a good investment. 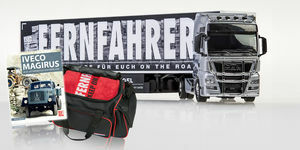 The wheel base extension by more than 70 centimeters enlarges the luggage hold between the axles by a whole two cubic meters compared to the hold in the FMD2-122. Although the Futura´s turning circle is around one and a half meters larger, this never proved to be disadvantageous during testing. It is above all the FMD2´s heritage from coaches that is apparent here and in the handling and ride. The ZF front-axle suspension is somewhat firm and occasionally rumbles quietly, but the low Futura nevertheless offers a very comfortable ride overall. Only the steering system, here in the simple version without speed-dependent power assist, could benefit from a bit more precise feedback near center position. As is typical for VDL, the manufacturer dispenses with expensive gimmicks. Neither adaptive shock absorbers nor a hydraulically steered third axle can be ordered. Instead, adaptive cruise control and lane departure warning systems will be available soon. The first vehicles are undergoing testing. From the 2015 model year, all new Futura vehicles will also be certified according to ECE R66.02 (roll-over stability) An emergency brake assistant is to be added later. Comfort is enhanced by the low noise level in the cockpit and passenger compartment. This is a top-notch achievement at the premium level. But does the driving performance meet such high demands? The new Euro-6 MX11 six-cylinder engine from Paccar superbly transfers 369 hp and 1,600 newton-meters of torque to the road. The bus is equipped with the less powerful variant rated at 330 hp and a maximum torque of 1,400 newton-meters as standard, but pairing this engine with the long vehicle should be avoided at all costs. By contrast, the AS-Tronic from ZF is a very good match. It features refined tuning and controls. Gear changes are rapid and hardly detectable. Only the demanding topography on the serpentine climb at the notorious Solitude racing circuit near Stuttgart poses a very difficult challenge for the engine and gearbox. The only remedy is the manual gearbox mode. It therefore would be ill-advisable to attempt a tour through the Alps with this drive combination. On the other hand, the 10.8-liter engine is unbeatably stingy. It achieves consumption values that can justifiably be called phenomenal. 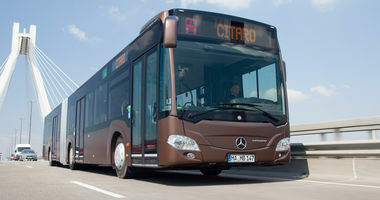 23.4 liters of diesel per 100 kilometers is a record on the demanding omnibus test route. The consumption even dropped considerably below 20 liters on highway A81. The VDL additionally had to complete the standard long-distance circuit, because this middle-decker is also well suited as a traditional dual-income source. The combined consumption of 31.7 liters is also several liters below the test results of comparable vehicles. Besides the low vehicle weight, the improved aerodynamics probably contributes to these record values. The Futura´s cockpit also offers tangible advantages. It offers the driver many storage areas, and the multifunction steering wheel is easy to grip. The large exterior mirrors provide excellent visibility. The tour guide is worse off, because his removable seat is slightly too low and he lacks reachable storage areas for his notebook or laptop. VDL buses never had the reputation of being fuel hogs anyway, but this middle-decker—which is suitable both as a dual-income source and as a fully-fledged coach on less demanding terrain—has proved it has what it takes to set a consumption record. With a 330-liter additional tank, the FMD2 can travel an incredible distance of 2,800 kilometers without stopping at a gas station. The resulting CO2 emissions amount to only ten grams per person-kilometer—a value usually achieved only by double-deckers. Another praiseworthy feature from VDL is the option of equipping almost every bus with several places for wheelchairs. This still isn´t a matter of course for all manufacturers. Furthermore, the price of this central European-built vehicle should be the final convincing argument for many a thrifty buyer to sign the dotted line.